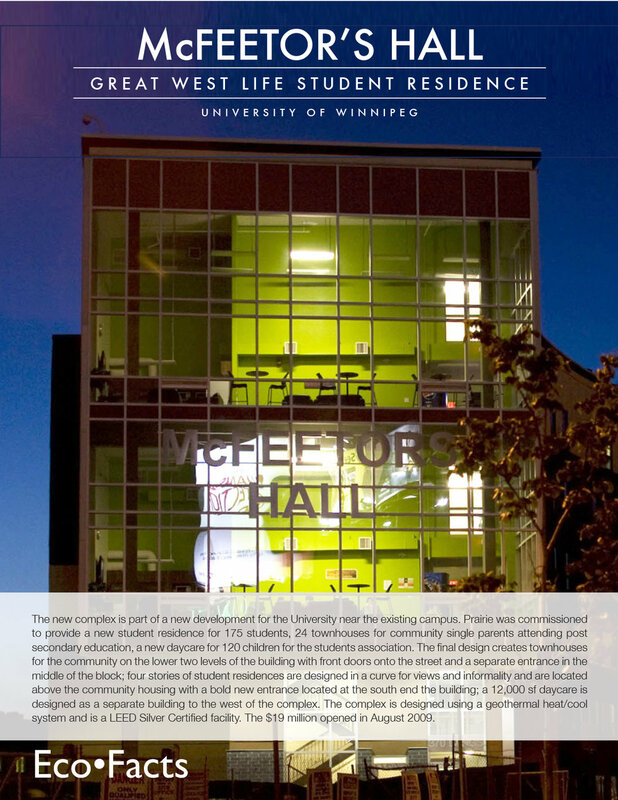 McFeetor's Hall | prairie architects inc. The University of Winnipeg’s McFeetor’s Hall housing complex is part of a recent development for the University near the existing campus. Prairie was commissioned to provide a new student residence for 175 students, 24 townhouses for community single parents attending post secondary education, 15,000 sf of academic space, a new day-care for 120 children for the students association and a parking structure for 250 cars. The final design creates townhouses for the community on the lower two levels of the building with front doors onto the street and a separate entrance in the middle of the block; four stories of student residences are designed in a curve for views and informality and are located above the community housing with a bold new entrance located at the south end the building; an entrance to the academic offices for the new International Centre is located at the north end with a elevator up to the academic floor on the third level; a 12,000 sf day-care is designed as a separate building to the west of the complex adjacent to a two level parking structure. The complex is designed using geothermal heat/cool system and is a LEED Silver facility. The street level component of the housing complex is a series of 2 storey townhouses. The intent of the townhouses is to provide housing for students with families. Half of the townhouses face onto Langside Street and half face into the green interior street. Each of the Langside townhouses has a front door, sidewalk and small yard directly onto the street with upper bedroom windows overlooking the street. Most of the units are 2-bedroom with several 3-bedroom units and two fully accessible units at grade. The townhouses have a central common room and fenced play area for townhouse children located off the interior green street. The student housing is located above the townhouses on four levels. This housing is designed in a gently curving form to maximize the views onto the street, provide decks on the roofs of the housing and provide a flowing signature form to the new university housing. The entrance to the student housing is from Portage Avenue with a bold two storey covered entrance courtyard off of the Portage piazza ourtyard. A six storey glass wall will signify the front of the building with the bold identifier of the university and lead donor. Student common rooms and lounges will be located at the north and south ends of each hallway to provide amenity space such as laundry, studying, and recreation looking onto the street. The UWSA daycare is designed as a series of connected yet visually independent pavilions. The facility is located on the north of the site closest to the Spence community and University and adjacent to Furby Place. The intent of the daycare design is to place the play spaces surrounding a central enclosed courtyard and fenced green space in order to maximize the sun and daylight to the interior space and provide a directly accessible outdoor playspace. The new facility is designed for approximately 110 children and is intended to draw children from students, faculty and community residents.